How Much Source Material Does HBO’s ‘Game of Thrones’ Have Left to Work With? Warning! Some mild “Game of Thrones” spoilers follow. I’ll refer to book chapters told from the point of view of characters that have not yet appeared in the HBO series. Read cautiously. So far, the HBO series “Game of Thrones” has mostly stuck to the words that George R. R. Martin wrote in the “Song of Ice and Fire” books. Fans who have read the books follow along giddily as their nonreader friends are shocked by the twists. But last Sunday was different. The show runners went off-script, filming some jaw-dropping sequences — for readers at least — that didn’t take place in the book and may or may not have some remarkable implications for book readers. The decision to deviate from the source material makes sense given how much of it the HBO producers have left. Seasons 1 and 2 mostly covered the first two books, “Game of Thrones” and “A Clash of Kings.” The third and fourth seasons track (approximately) with the third book, “A Storm of Swords.” The show has also taken material from the next two books, “A Feast For Crows” and “A Dance With Dragons.” Those books will also (allegedly) comprise the show’s fifth season. The sixth season will presumably be based on the sixth book, which isn’t written yet. That’s an issue for another day. So really, how much source material is left for HBO to use? Martin writes his chapters in point-of-view format — each chapter is seen through the eyes of a single character — so I counted how many chapters each character has in each of the books (not including one-off prologue or epilogue chapters). 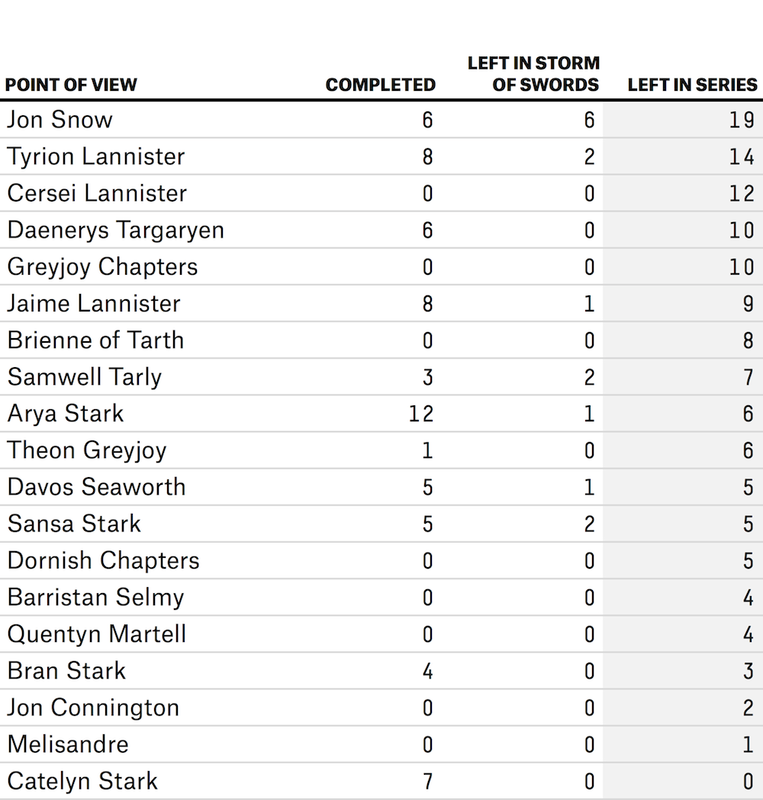 In the chart, I’ve lumped all of the chapters that take place in Dorne and among the miscellaneous Greyjoys into two single groups to mitigate potential spoilers for those who did not heed our warning. But there are still spoilers in the chart. Next, I went through the books to find out how many of the chapters have already taken place on the show. HBO is currently in the middle several chapters, so I’ve listed only the ones that have been completed. This required a few judgment calls, so I stayed conservative. For example, last week’s episode — “Oathkeeper” — contained the final scene of Jaime Lannister’s ninth “Storm of Swords” chapter. But lots of material from that chapter hasn’t been on the show yet, so I reasoned that he has completed only eight. Maybe tonight the show will present material from his first “Feast for Crows” chapter, but who knows? Notice a couple of things: Theon and Bran’s stories are already drawing from material in “A Dance With Dragons.” HBO just mixed in some non-book material in Bran’s storyline — the capture at Craster’s! — so the show seems to be buying time, attempting to spread three chapters left in the series over sixteen more episodes. Also, are you ready for more Jon Snow (Kit Harington)? His storyline has the most material left, and he’s apparently taking a detour back north of the Wall next episode that wasn’t in the book. Winter is coming, and we are in for some serious Snow. Let’s just say we’ll probably see tons of Kit Harington moving forward, if only because nobody has much left to do in the third book. Tyrion, Samwell and Sansa have two chapters left; Arya, Jaime and Davos have one. So expect more non-book detours, and perhaps some material from the next two books. 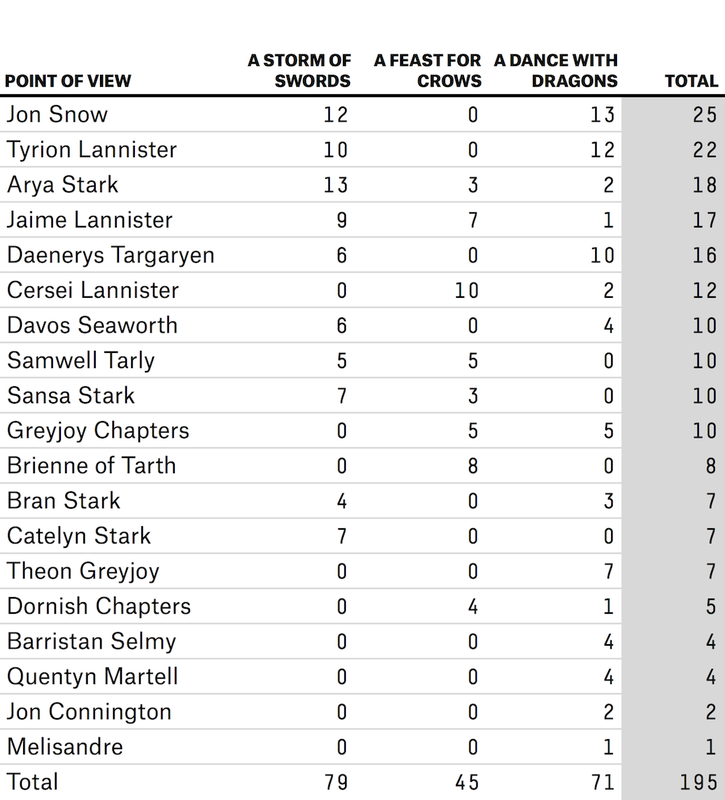 Correction (May 4, 1:42 PM): A previous version of this post included a table with the incorrect number of chapters in George R. R. Martin’s “A Feast for Crows” and “A Dance With Dragons” told from the perspective of Greyjoy characters. Each has five (not including Theon Greyjoy’s chapters). The table has been updated.